Bamboo is an exotic and beautiful natural flooring choice with numerous attractive qualities that it can lend to a variety of environments. However, it also has some inherent vulnerabilities which can cause problems under certain conditions. Understanding the limitations of the material, and the reaction that it will have to elements like humidity, liquids, staining agents, and high traffic use, will help you to make an informed purchasing decision. This material is denser and resistant to water damage than most woods, and it does have some mild natural antimicrobial properties. However, it’s not invulnerable and moisture is still a hazard for bamboo. If installed in a wet environment where liquids are allowed to sit on the surface of the floor, the planks can be subject to warping, plumping, and staining. This can also lead to the growth of mold and mildew, especially in the subfloor. Even if they don’t face splashes and puddles humidity can still cause damage to bamboo floors. Spaces such as bathrooms and basements are especially prone to these problems, and that water in the air can actually be more insidious than direct liquids. Slipping subtly down through cracks and crevices, moist vapors can cause long-term damage to the planks themselves, while also nestling in the subfloor to cause the growth of microbial menaces. You should avoid the use of bamboo in heavy and moderate use bathrooms and most below grade installations. If installed in a kitchen then constant caution and upkeep will be required to maintain the floor. Bamboo may look like wood, but it is actually a grass that is shredded down and then molded back together using heat, pressure, and adhesive. In some low-quality materials, the adhesive used will contain formaldehyde which is a toxic substance that can off-gas small amounts of volatile organic chemicals over time. This issue can be eliminated by only purchasing from reputable dealers. While bamboo is a relatively hard material, it can be subject to scratches, dents, and cracks under certain conditions. Over time pet nails, or unpadded high heels can cause unsightly marks on the floor, and if furniture legs are carelessly dragged across its surface permanent damage can be the result. Even small particles of dirt and debris can act like grit, sanding and scoring the flooring over time to give it a dull broken appearance. 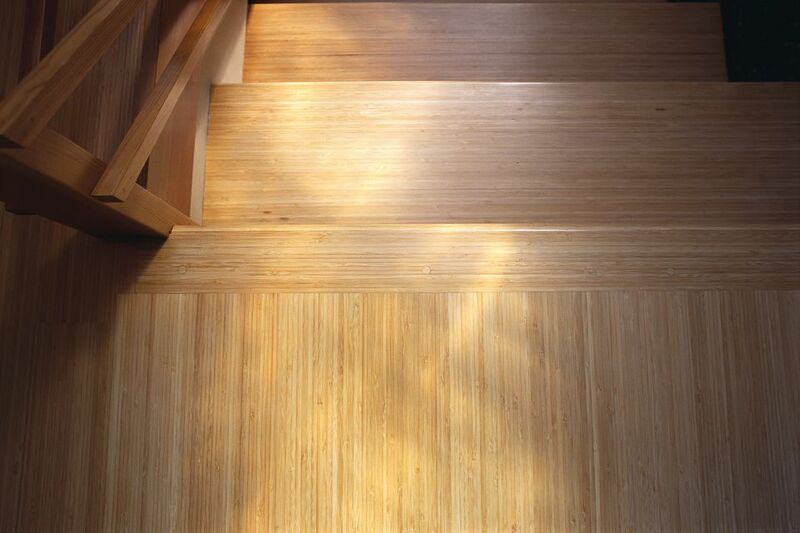 The carbonization process uses heat to darken the appearance of bamboo for aesthetic appeal. This allows it to be offered in a variety of shades and hues, to match the specific look of the room where it is being used. The drawback is that this method weakens the material, making it softer and more prone to damage from impact, abrasion, and liquid staining. The grass that bamboo flooring is manufactured from is all natural, organic, and readily renewable, with a growth cycle that only takes 3-5 years to reach full maturity. The harvesting process also allows the stalks to be cut without harming the root, so replanting is not necessary. This makes bamboo a very eco-friendly resource, at least at first look. However, there can be an environmental cost to the manufacturing of bamboo. The rising popularity of these materials is prompting some farmers to overgrow these plants to the detriment of the natural balance of flora and fauna in their environment. The majority of bamboo also comes from Southeast Asia, which means that there can be a carbon cost associated with transporting it to locations outside of that region. You should never immerse a bamboo floor in water, so wet mopping isn’t an option. That means that regular maintenance will require a little bit more work and care then simply sopping the surface with suds once a week. Sweeping and vacuuming regularly will help to get rid of small dirt particles that can cause scratches. Then the floor can be Swiffered, or damp mopped on occasion, as long as any lingering liquids are wiped free immediately afterward. One of the challenges facing engineers looking to use bamboo for flooring is the lack of internationally recognized standards for these products. The one exception is the “Acceptance Criteria for Structural Bamboo” passed by the International Conference of Building Officials in 2000, however that focuses more on usage as load bearing components rather than surface coverings.